Clinic Synopsis: Finding music that satisfies the requirements of your small ensemble can be difficult, especially if your instrumentation is not “standard.” Members of the group will discuss the processes of creating effective transcriptions and arrangements for small instrumental ensembles. Included will be live performances by the quartet of demonstrative selections from its working repertoire. Clinician Biographical Information Established in October 1999, the United States Navy Band Brass Quartet has reached thousands of people of all ages through the performance of public concerts and Music in the Schools programs at Washington area recital halls, churches and schools. The group has performed for national audiences on three live broadcasts from the Kennedy Center Millennium Stage and has made three appearances on NBC's "Meet the Press." The quartet has given masterclasses at the Navy School of Music in Little Creek, Va., Mary Washington University and at St. Thomas, Virgin Islands. Since its formation, the quartet has generated a unique repertoire of arrangements, transcriptions and original compositions encompassing diverse styles that represent American patriotic and folkloric musical traditions as well as light classics. Chief Musician John Schroeder, originally from Portland, Ore., joined the Navy Band in 1993. He earned a Bachelor of Music in trumpet performance from Indiana University in Bloomington, Ind. He has performed with the Indianapolis Symphony Orchestra, the Evansville Symphony and the Owensboro Orchestra. Additionally, he served as principal trumpet with the Orquesta Filarmonica de Santiago, Chile, and as principal trumpet with the Orquesta Sinfonica de Chile. He also taught trumpet at the Universidad Catolica de Chile and performed extensively in chamber ensembles and as a soloist throughout the country. A founding member and current chief in charge of the Navy Band Brass Quartet, he has composed, arranged and transcribed more than 60 pieces of music that constitute a unique repertoire appropriate for recitals and music in public schools as well as official ceremonies. Second Clinician Biographical Information Chief Musician Stanley Curtis, originally from Tuscaloosa, Ala., joined the Navy Band in 1998. He earned a Bachelor of Music from the University of Alabama in 1986, a Master of Music from the Cleveland Institute of Music in 1988 and a Doctor of Musical Arts from Indiana University in 2005. Curtis has performed with the Cleveland Orchestra, the Evansville Philharmonic, and the Orquesta Sinfónica de Galicia in La Coruña, Spain. In 1994, he was a Netherlands Fulbright Scholar and studied baroque music in Amsterdam. A devoted educator, he has taught trumpet at George Mason University and has chaired and organized the historic division of the National Trumpet Competition. Curtis is a featured soloist with the Concert Band. An avid composer and arranger, he has organized and arranged musical pieces for a Navy Band trumpet ensemble for performances at three professional conferences. 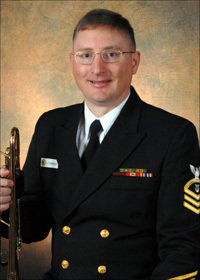 Third Clinician Biographical Information Musician 1st Class Philip Eberly joined the Navy Band in July 2008. Originally from Shillington, Pa., he earned his bachelor’s degree in music education from George Mason University, and a master’s degree in euphonium performance at the University of North Texas. His primary instructors include Roger Behrend and Brian Bowman. In 2007, he was the first place winner of the Leonard Falcone International Euphonium competition. Fourth Clinician Biographical Information Musician 1st Class Anthony Halloin, originally from De Pere, Wis., joined the Navy Band in 2004. Prior to his appointment to the Navy Band, Halloin completed a Bachelor of Music with a teacher’s certification at the University of Michigan and a Master of Music at Indiana University. At IU, he served as associate instructor of music education, training future music educators to teach brass instruments in the public schools, and also completed the requirements for a cognate field in jazz improvisation. In 2010, Halloin received his Doctor of Musical Arts from the University of Maryland. He has performed with the Indianapolis Symphony, Columbus Indiana Philharmonic, the Fairfax Symphony Orchestra, and Phil Ogilvie’s Rhythm Kings. His teachers include Steve Dumaine, Toby Hanks, Daniel Perantoni, Fritz Kaenzig, David Fedderly, Tony Kniffen, and Michael Grose.